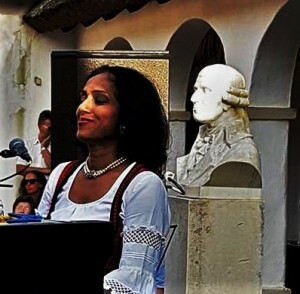 Rohrau in Lower Austria, next to Burgenland, Hungary and Slovakia – the place where Joseph Haydn was born. For the second time within a year Marialena Fernandes and Hotel Palindrone performed at this place of pilgrimage for all classic afficionados. How to describe the feeling when you appear next to the great master’s statue? Next to the rooms and in the court of the Pannonian house where he grew up and developed his talent? We felt his eyes on us and it looked like he was twinkling, approving to what he heard. If you visit the Haydnhaus, you should definitely walk over to Rohrau Castle housing the Harrach Gallery. A collection of world-wide distinction and yet unknown to many travellers (and Austrians as well). A magic world full of master pieces. For example, “Three ladies playing music” by the Master of Female Knee-Length Portraits (Meister der weiblichen Halbfiguren), Luca Giordano’s “Paris’ judgement” and Antonio Grassi’s “Joseph Haydn’s bust”. 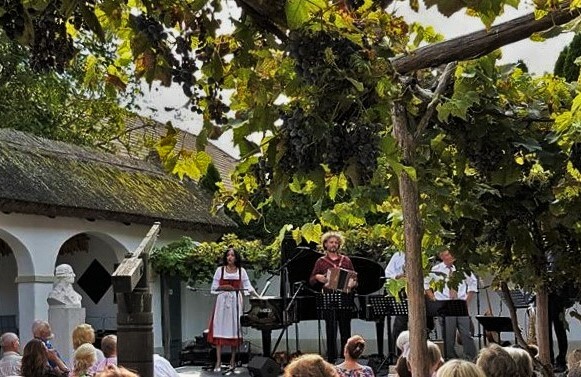 Furthermore Rohrau is located next to the vineyards of Petronell-Carnuntum (also renowned for its Ancient-Rome-archeology-park) where you can taste elegant Grüner Veltliner and aromatic Blaufränkische. 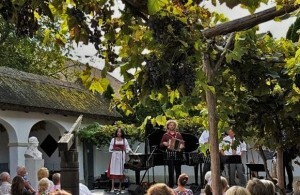 At taverns run by the wine-makers themselves, the Heuriger or Buschenschänke.